It is July, and something feels out of place… oh yes! I know what it is! In years past, I would be preparing for NI Week, but this year is different. NI Week took place in May instead of August, so here I am writing a blog post about one of the presentations we gave at NI Week, instead of preparing it. Darren Nattinger from National Instruments agreed to present with us. We had the opportunity to watch him code an entire application, using DQMH, from zero to an executable in less than an hour, in front of an audience. To make things more interesting, the application included communicating with hardware, which in this case was a Peloton Cycle bike. Darren might have retired, invictus by the way, from the Fastest LabVIEW Programmer competition, but he is still the fastest LabVIEW developer I know (sorry Matthias Baudot and Robert Mortensen). Why do we care about programming faster? A manager would say “to be more efficient, produce more working code in less time”. As a programmer, I find that the use of shortcuts, templates and other automation tools help me stay focused on the task at hand. I am not distracted by additional steps to get the task accomplished. That is one of the reasons I love the DQMH scripting tools, I can create a DQMH Request Event without being distracted by all the steps involved in creating an event. 44:06 Use Ctrl+Shift+B to change the property/method on a Property Node or Invoke Node. For this to work, you need to know the exact name for the given property or method. Earlier in the video, he used this for setting the method “ctr.val set”. By the way, if you have ever wondered how I would sound if I spoke at a decent speed, this is a good example of that. I had to slow down the audio to keep up with the code recording. 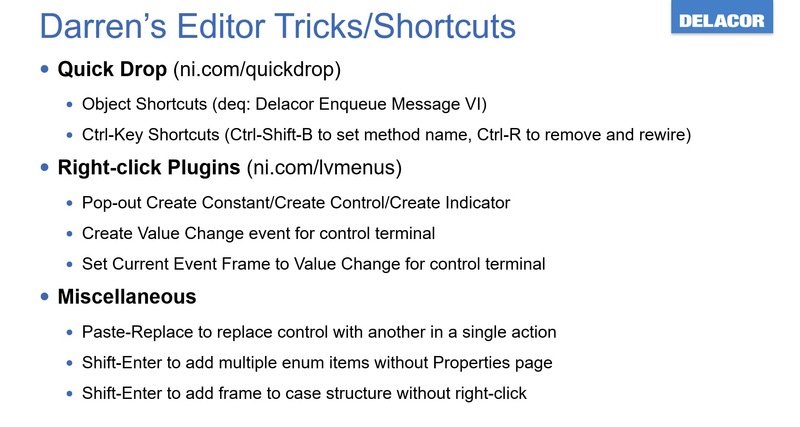 46:40 Shift-Enter to add multiple enum items without going to the Properties page. This also required selecting the correct tool. When using auto tool, you can hold Ctrl key to get a “second try” tool if don’t like the one that auto tool picked. In the enumerator case, auto tool assumes you want to operate on the enumerator, but with Ctrl, the second try is that you want to edit the text. By the way, the use of the Ctrl key to get to the second try tool is a good way to convert people who are not using the auto tool yet.